This started rather innocently: "What if I put a community shower under the BV waterfall?" ...and I ended up spending 3 weeks on this. - Waterfall/shower in 3 different rock textures, found under "plumbing/miscellaneous". The decorative ferns have two colour options, and one invisible recolour. - 10 different rocks in 3 colours, available in build mode, with the shrubs. These use the repository method so only the one with "MASTER" in the name is recolourable - the others will automatilly use the new textures. - Sims whose temperature is above average will have a "cool down" option available, with different animations. While they shower naked, they'll change to swimwear for this and won't get automatically dressed afterwards. Much to my surprise, they'll sometimes use this option autonomously if they aren't too far from the waterfall... Big mystery, since I tried hard to find how to do that and failed (temperature can't be advertised like other motives); the interaction advertises a little comfort, but sims seem to use it regardless of their comfort level. - all the clean and maintain interactions were stripped mercilessly, so sims won't attempt stupid things and it doesn't mess with the FT "tinker" stuff. - all the garden and trimming stuff was also removed from the rocks. Seems to work fine in Free Time. The waterfall is a big object (5 tiles by 7) but the footprint is only one tile; I didn't make it this way because I was too lazy to register 35 GUIDs, but for convenience. - the blue tile is where the shower's green tile will be placed, right under the waterfall itself; I lowered it by 4 clicks in the example, 3 clicks will work too. - the red tile is where the sim will enter and exit, there needs to be a gentle slope to the blue tile so he can walk between both; this tile can still be on a slope. 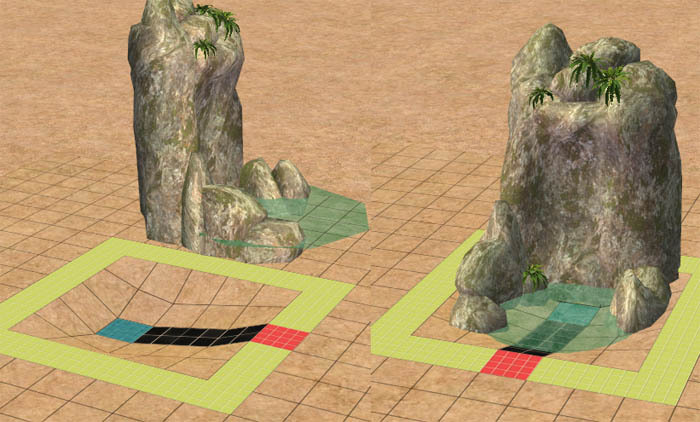 - since the waterfall and rocks all have 1 tile footprints, sims will walk through parts of them if they aren't blocked by other decoration or invisible fences. Thanks : to Numenor, Echo and Jasana Bugbreeder for their precious tutorials and explanations, to Quaxi and Peter Jones for SimPE and the behaviour editor, to my dear Beosboxboy and Miss Doh for beta-testing.